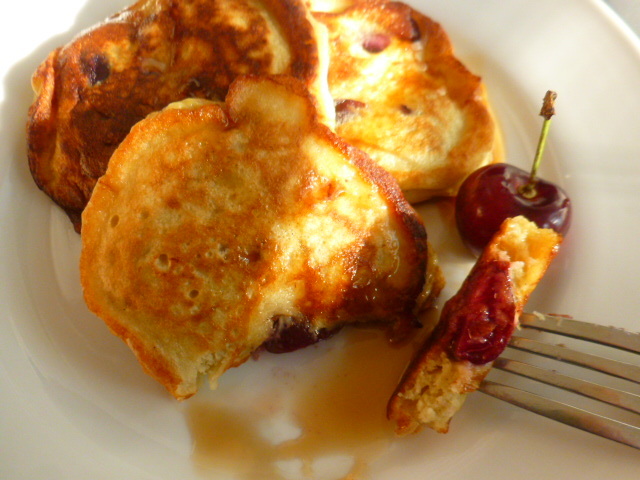 Quick and easy to make, fluffy and tasty pancakes are a favorite weekend brunch item. They are also great as a light snack, and if you celebrate Hanukah this week, they are a wonderful addition to the traditional Latkes or fried doughnuts. The version I have here has a pronounced banana flavor, with a touch of acidity from the cherries. Try them and enjoy. 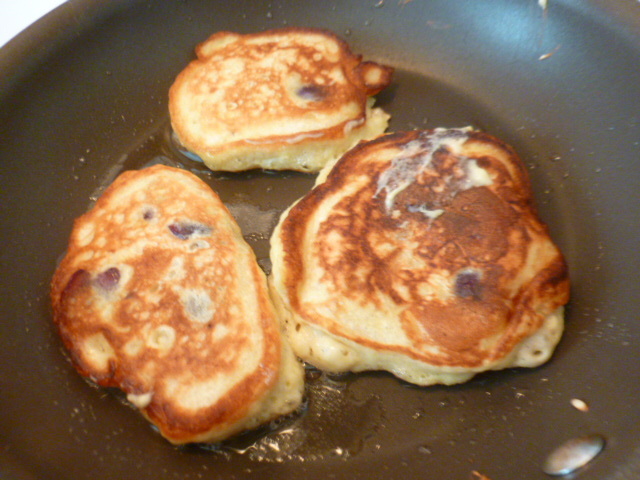 * Using more mashed bananas than flour makes the pancakes moist and less heavy. 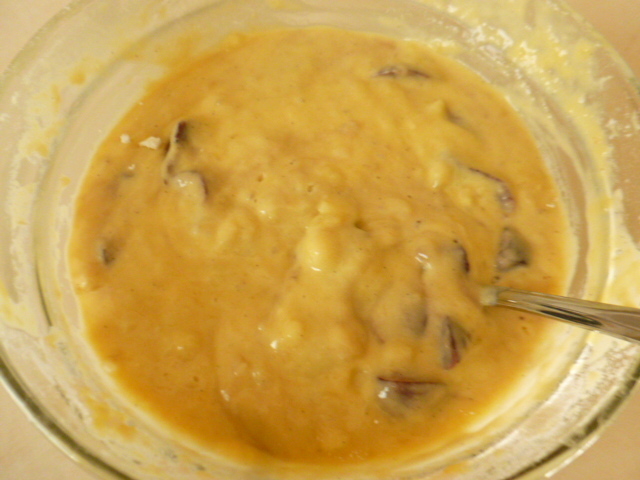 The batter may look too dense when mixing, but don’t be tempted to add milk to it, as you’ll end up with a batter that doesn’t hold its shape when frying. * As the bananas are quite sweet, and the pancakes are served with maple syrup, I prefer to add just a hint of sugar to the batter. However, if you prefer sweeter pancakes, add more to taste. 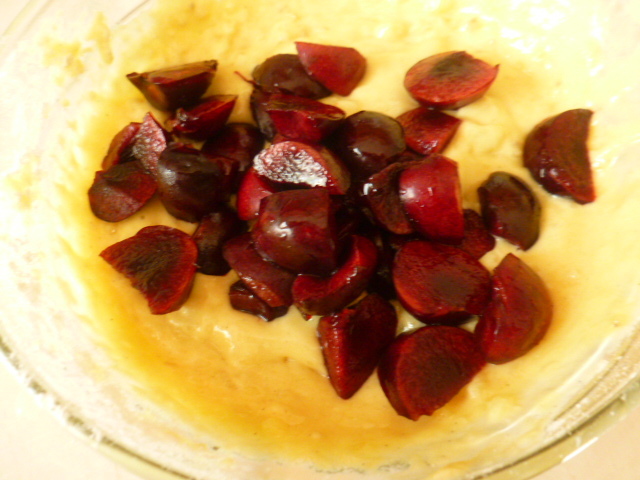 * Frozen thawed cherries can be used instead of fresh ones, but pat them dry with paper towels before adding to the batter, so they will not be too watery or change the color of the batter. Fresh berries, especially blueberries, can also be used instead. 1. 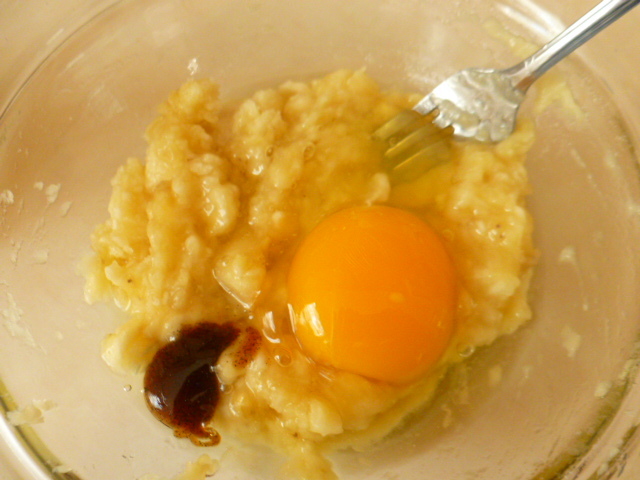 In a medium bowl, mix the mashed banana, eggs, vanilla and sugar. 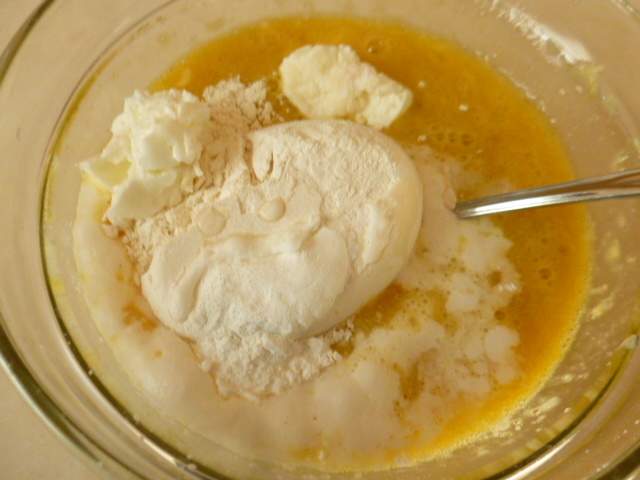 Add the yogurt, flour, baking powder and salt and mix well. Add the cherries and mix. 2. Pour 2 Tbs oil or clarified butter to a medium frying pan and place over medium-high heat. 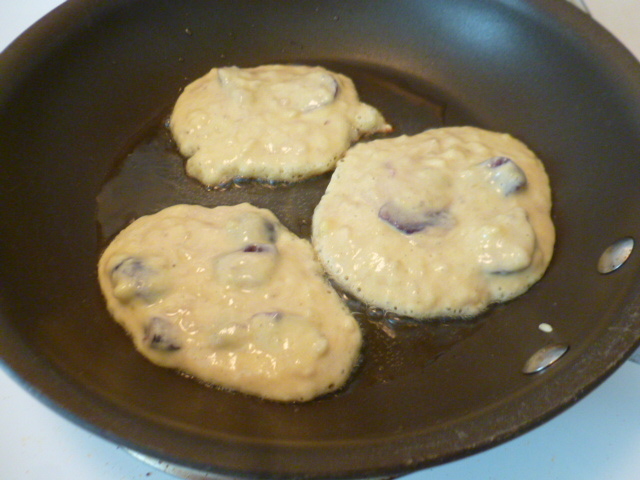 Lower the heat to medium and add ¼ cup of the batter for each pancake. Fry until bubbles appear on top and flip to fry the other side until golden. Serve immediately, with maple syrup on the side. Delicious-looking latkes – thank you, Ronit! Certainly, but with four little ones around the table who are being brought up the Israeli way, I have to have Sufganiot, in addition to latkes! Those pancakes are beautiful Ronit. I have been dissatisfied with my pancake recipe they are not fluffy like I like . I will give this one a try I love the addition of bananas. Thank you Suzanne, I’m glad you liked the recipe. Yum! Happy Holidays Chef Ronit! DH wants his usual Sunday French toast/bacon/polenta/poached eggs this morning, but I may try out a version of your pancakes as a light lunch later on. I too would find it hard to switch from such a tasty brunch! Thank you for sharing the recipe Ronit! I will try this with lots of banana. Sounds delicious. 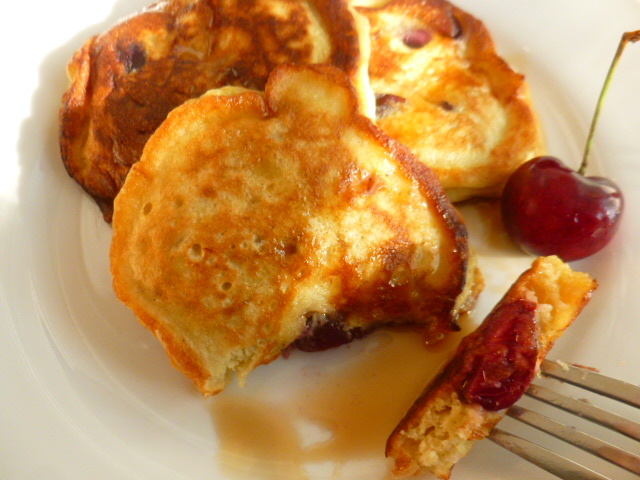 I have banana pancakes all the time (except I use coconut flour), but I love the addition of the juicy cherries. Will definitely try it next time. Thanks Ronit. Wow – was für eine tolle Kombination! Das Rezept werde ich auf jeden Fall ausprobieren! 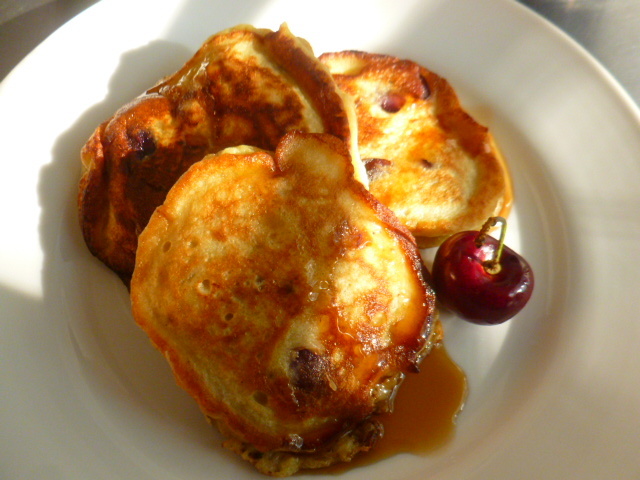 I’ve always found pancakes are too heavy too, these look nice and light and fluffy! Traditionally, any food that’s fried with oil is suitable, as the miracle celebrated had to do with oil. I want this so much right now! Looks amazing, nice post! starting the day with pancakes is the EST! These looks so full of flavour. I like this recipe with the yogurt ,Ronit. It must add protein and a nice tang too. 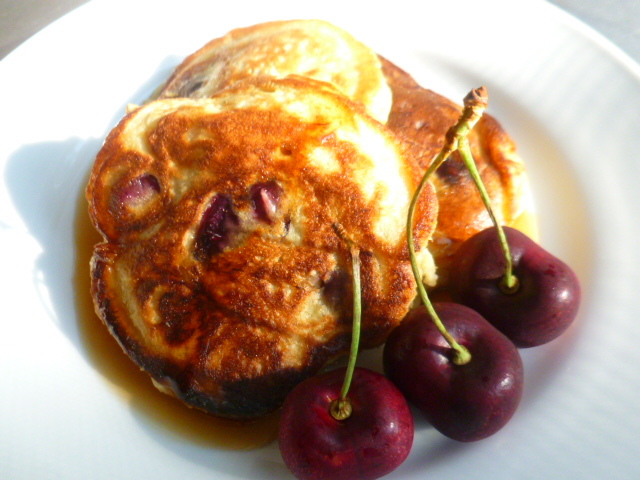 Love banana pancakes and the cherry really puts a cherry on the top! It’s one of my “this and that” kind of pancakes and it worked so well, it was worth documenting. Other fruits can be used as well, and I sometimes add nuts too. Wow, these sound and look absolutely delicious! Sorry I am neglecting my blogging but I have been out of town for 2-1/2 weeks caring for a younger sister who had serious surgery. Pancakes, flavored with fruit, are a favorite in my family. Never used cherries though. Looks delicious Ronit! Thank you Judi, I’m glad you liked this version. I didn’t use cherries either but now that I did, I’m a big fan. Hope your sister will fully recover soon. She’s so lucky to have such a supportive sister. Beautiful pancakes Ronit. Thanks for this great share! !